The 2002 American Gold Eagle Coins saw a slight increase in both their total proof and bullion numbers. Leading the increased interest in the strikes was probably the elevated levels being seen in the gold market. The precious metal averaged only $271.04 in 2001 but was definitely on its way up. In fact, the lowest spot price seen in 2002 for gold occurred in early January at $277.75. The rest of the year saw increasing prices with the annual average for the year coming in at $309.73 – a level not attained since 1997. Bullion Eagle mintage saw slight increases for the year after coming off their lowest total level in a decade. The gains were led by the One Ounce strikes which improved by over 50%. Proof Eagle mintage also saw increases but its improvement was led by sales of the 4-Coin Sets. The chart below shows the total mintage of 2002-dated Proof Gold Eagles which includes the number sold as part of the Gold Eagle 4-Coin Set (of which 19,679 were sold). The 2002 Gold Eagles marked the seventeenth year in which the US Mint produced the strikes. 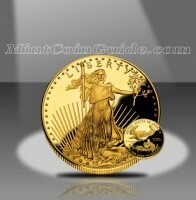 Bullion Gold Eagles were available from the Mint’s network of authorized purchasers for most of the year. Proof Gold Eagles went on sale June 5, 2002. The US Mint maintained the same pricing level it had established the last few years for the Proof Gold Eagles – $570 for the One Ounce Eagle, $285 for the 1/2 Ounce Eagle, $150 for the 1/4 Ounce Eagle and $70 for the 1/10 Ounce Eagle. The 4-Coin Set was $999. Bullion Gold Eagles were available from the Mint’s network of authorized purchasers for a small premium above the spot price of the gold in them. Proof Gold Eagles were struck at the US Mint’s facility in West Point and contain a ‘W’ mintmark. Augustus Saint-Gaudens originally designed the image of Lady Liberty seen on the obverse (heads side) of the Gold Eagles for the 1907-1933 Double Eagle Coin. The reverse (tails side) was designed by Miley Busiek and shows a family of eagles in their nest with the male flying above it.